Bonzai: I’m here with Mark Linett in his studio. Do you have a name for your studio? Linett: This is Your Place or Mine Recording. We do a lot of remote recording as well. Bonzai: This is a nice desk. It’s a heavily modified API? Linett: Yes, it was originally built around 1977, and it was installed at the Electra Ranch, which was their demo studio out in Northridge. When that closed, Jeff Porcaro, the drummer, bought it, had it modified somewhat and installed in his home studio. The story was that after five or six years his wife got tired of having the clubhouse in the back, so he sold the whole studio to a now defunct music school called Grove. They never commissioned it, and eventually sold it to me through a broker. I stored it for several years at the Beach Boys warehouse, and then when I bought this house I installed it here, did one project, realized it was too small, sent it out and had it expanded from twenty four to thirty six channels. This is the second control room of the studio that we built, and over the years we added flying faders. About fifteen, twenty years ago I got tired of the modules breaking, and eventually was able to get the genius Steve Firlotte at Inward Connections to build me all new input modules, which was no small task, I tell ya. Back in the day when you needed what I have, which is twelve echo sends, and two stereo cue sends, and all those great things. Bonzai: What is your recording medium of choice these days? Linett: These days, like most people, I’m solely in Pro Tools. I maintain a collection of analog tape machines, but mostly, almost entirely, just for transfers. Being the Beach Boys archivist and reissue producer we still do an awful lot of transfers of their original tapes in all formats. I have everything from mono, to stereo, to three track, to four track, to eight track, sixteen, twenty four. When we handle the digital formats we generally bring the machines in, but that doesn’t happen too often. Bonzai: Your monitors, now, are these Barefoot MM27s, Gen2? Linett: Yep, I’m on the Gen2s. I’ve had the MM27s pretty much since their introduction. 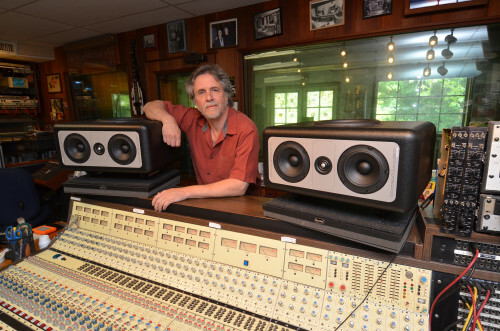 Tedi Sarafian asked me to demo a pair, and I had been using Tannoy SGM Golds with Mastering Lab Crossovers for years. I really liked them, I still do, actually, but they were always difficult to mix on. There was always something in the bottom end between the bass and the kick that was always tricky to get right the first time. You’d do a mix, take it somewhere else, and realize, “The balance ins’t quite right, I’ll have to come back and do it again.” Teddy convinced me to try these speakers, and I don’t try a lot of this kind of stuff. My feeling has always been it’s kind of dangerous to change your monitors, especially. Right or wrong, you get used to what you’re working on. If you’re good at it you can get used to anything. I tried them and I really liked them. I did a bunch of quick mixes, and it was so easy to get the balance right, they sounded good elsewhere, and then Teddy told me that they were the demo pair and that I was going to have to wait four weeks, five weeks to get my real pair. They took them away and I put the Tannoys back up, and suddenly I could tell exactly what had been the problem using the Tannoys, that the mid range was pushed and that the bottom end was a little funny. It was great when the real pair arrived. I guess it’s been a little less than a year that the Gen2s came along, Tedi encouraged me to try those and I really like them They’re an improvement, and although I don’t use it a whole lot, the digital modeling of other speaker types is really nice just to reference something for a few minutes after you think you’ve got it right. Bonzai: What is the theoretical goal of a good monitor? What is it supposed to do? Linett: In theory, you want something that’s accurate. You don’t really want something that’s a huge hype. It’s nice to listen, because most home speakers have a smile curve, the bottom end and the top end tend to be boosted loudness. It’s nice to listen to what the consumer is going to listen to, but in terms of a studio environment, you want something that’s quite a bit more accurate, especially the imaging, that where the placements are is accurate. Also, while there’s always a sweet spot more or less in the center, that it’s not so restricted that you have to really concentrate to figure out where the sound field … how that’s being represented. For me, the thing about the Barefoots has always been that whatever I do in here, whether it’s quick or I spend a lot of time, I hear little things that I want to change, but it’s never big, major changes in the frequency response, which was always the problem with other speakers. Bonzai: Some people have the speakers mounted vertically and some people have them this way. Why do you have them horizontal like this? Linett: I started using them horizontally and liked it. When I was demoing the ones versus the twos I had them up vertically so that I could go back and forth. Actually, when I finished I kept these up vertically for a while, and then it seemed like, for me, the distance, the level, and all that, that the dispersion and the sweet spot had changed. Again, it’s probably as much because of what I was used to. I’ve always had speakers, even SN 10s, probably, we had horizontal. I’m used to forty years of having horizontal speakers, even when they’re coaxials where it really doesn’t matter. It’s just one speaker. Bonzai: I see that the larger speaker in your configuration is firing up at the ceiling? Linett: The subwoofers don’t really matter. The subwoofers are omni directional anyway, so that’s not going to have any effect on the positioning. It’s more about what’s happening with the mids and the tweeter. Bonzai: The room itself, what’s that you’ve got on the ceiling there? It reminds me of high school, or an office. It doesn’t look like you’ve done anything monstrous, changing the room. Linett: I’ve got to put that panel back in, I’ve got one panel open for the cable trough. Except for that one run, the whole ceiling is stuffed with rockwool, between the drop ceiling and the floor above. The back wall as well, it’s all rockwool. We didn’t build this trying to make it any particular acoustic environment, it just seems to work. Nearfields help. It’s an even bigger concern when you’re dealing with large soffit mounted speakers that are really going to excite the room. Bonzai: Do you ever bring clients in here to listen? Linett: Oh yeah, all the time. I’ve gotten lots of really positive responses. If I have a project I’m working on elsewhere and I bring it here, everybody’s always impressed with the sound of these speakers. They’re really great sounding speakers. Bonzai: It sounds like you’re a happy camper. Linett: Oh yeah! If I could just put a handy grab on them so I could pick them up easy. Bonzai: They’re kind of heavy? Linett: They’re very heavy, but that’s part of why they’re good. I’ve got them on these decouplers. They really don’t need it because they’re so massive. They don’t do what other speakers do, which is react with the surface that they’re sitting on. I like them up a little higher, anyway, and Auralex gave them to me. Bonzai: Probably improves your posture, too. Linett: Yeah, exactly, you’re not stooping quite so much. Bonzai: Alright, I think that’s about it. Is there anything in this room that would really make a technological person start salivating? Linett: The big feature here, and I don’t like to take pictures of them, are these two original UA Bill Putnam designed 2 consoles. They’re both original to what used to United Western Studios, which is now Oceanway and EastWest. This one was the original remote console when they started the business, and was the twin … there were two of these built. There was this one for remotes, and another one that was put in Studio Three, where you see Brian sitting in1964. If you look closely you can see that it’s pretty much the same exact console. Bonzai: With the round pots. Linett: They all have that, but these two in particular are the only ones that I know of that are this vintage. The modules are different. Easiest way to explain it, this is an early high impedance board. Originally, when they built consoles, they were only designed for mono, stereo, three track, because that’s all there was. You weren’t thinking about, “How can I take twelve mics and put them on twelve tracks?” This console, when it was built, all you could do was run through the busses and have, at most, three tracks at a time. Somebody, at some point, modified this one to have a fourth track, and the last person to own it before me, who did a beautiful restoration on it, put transformers in every forth input, so you can take it direct out. It’s not what they were designed for. This was meant for up to three tracks recording. The one behind me was originally in Studio Two, this actual console. By this point they had put transformers on the outputs of each module before the summing buss, so its not why they did it, but it made it a lot easier when eight track and onwards came along. I don’t think this board was in service after eight track days. Bonzai: Do you use these? Linett: Oh yeah, I record on them all the time. Bonzai: I see one’s in the road case. Linett: Yeah, that’s the way it came to me. This one, I put in this setup years ago. This is a road case too. I envisioned taking it somewhere, but I never have. The covers are in storage, they haven’t been used. Bonzai: You use them because there’s never been anything to compare to these? Linett: I just think they sound great. Of course, being the person that listens to, and archives, and mixes old Beach Boy tapes all the time, so much of their stuff is recorded on these consoles. Maybe that’s why I have a predilection for them. We could have a whole discussion about how recording changed when it went from three track, four track recording to multi track. It’s really a different universe. The simplest explanation is why The Wrecking Crew in L.A., the core first call musicians in any major recording outlet, why those guys worked so much was because that was the only way you could record and know you were going to get something usable, and generally speaking, get three songs in three hours. You weren’t going to replace the bass, or worry about the kick drum sound. It was a whole different way of doing things. It struck me when I was working on the Brian Wilson movie Love & Mercy, because they hired real musicians and we transformed Studio Three, where most of the Beach Boys hits were cut, to make it look like the old days. We had them in the room with the right gear, and had them playing. They recorded ambient music, we didn’t record multi track, but to hear that in that room really gave you a sense of how records were made fifty years ago when leakage was your friend, not your enemy. Now we’re always concerned about the bass drum, solothe bass drum, what does that sound like? Nobody ever did that back then. In fact, the drums were the last thing that you put into a live mix, because a certain amount of drums was going to come through all the other mics. The drums were more filler. Of course, the way guys like Hal Blaine played, they played to the mics. There were no mics on the toms, that’s ridiculous. Bonzai: Hal, good friend of mine. Bonzai: It sounds so big. Linett: It’s just the opposite, it’s because they’re in a small room that you could open up a mic ten feet away and it would actually increase the depth, and you’re adding reverb, of course, and/or tape slap, which were the only two big effects you had. If you did it in a bigger room, the problem started to be that the slap back would be distracting and wouldn’t add to the sound. Gold Star is another one. Gold Star wasn’t quite as small as Studio Three, but almost. Bonzai: It’s interesting, here in your room you’re listening to the stuff that was recorded fifty years ago on monitors that were built last year, this year. Linett: Yeah, some of it was recorded to and listened to on 604s. You do hear things sometimes, very few, but you do hear things and wonder, “How did that get by?” Technical errors, a loose patch cord that wound up changing a recording, and it went out anyway. I’ve always wondered when there’s nobody around, whether they ever heard those things and figured, “It won’t matter.” You hear plosives on vocals all the time, and we take them out now, but big pops, on what I presume have to be condensers, that you would never let pass nowadays. Of course, on records they roll everything off below fifty, anyway, so that probably caught most of it. If it didn’t make the needle jump out of the groove, it didn’t really matter, is about the size of it. Now since CDs came along, and even higher quality formats, now you get into these issues where you want to preserve the whole frequency range, but you have to deal with this stuff. Bonzai: Thank you, it’s been educational and I’m sure that Barefoot will be happy to hear what you have to say about their product. Great, what a great room. Linett: Thanks, that’s why we kept the place when we moved. I’m not going to build another studio.